All the gimmicky studio effects in the world can't mask the fact that this album is likely to be one of the most hollow you'll hear all year. I've been listening to West Ryder Pauper Lunatic Asylum for some time now, and I'm still not entirely sure what Kasabian sound like. And no, that wasn't intended as some sort of backhanded compliment implying that Kasabian are so supernaturally original that they're beyond comparisons. Just the opposite: West Ryder Pauper Lunatic Asylum is often so anonymous that it feels like it could've come from any number of British musicians who grew up listening to Primal Scream and the Stone Roses, had the bucks to hire a capable producer (Dan Nakamura's talents have rarely been so misused), and had no reservations about going nuts with every single piece of equipment in the studio. Because why not? Why shouldn't the not-quite-title-track "West Ryder Silver Bullet" have a children's choir and a string section and an opening sample of a woman saying, "At that moment, poetry will be made by everyone, and there will be emus in the zone"? Why shouldn't we just suffocate these songs in an avalanche of bombastic studio drivel, instead of giving them room to breathe on their own? Because do that and you end up with -- just to prove that Kasabian aren't beyond compare -- the UK equivalent of the Chris Cornell/Timbaland disaster Scream. West Ryder Pauper Lunatic Asylum has a lot to do with spectacle and little to do with substance. I'm not just saying that because of this album's heavy reliance on the studio, because many of our best albums -- some might argue most of our best albums -- obviously owe a good portion of their transcendent power to the studio. No, I'm saying that because West Ryder Pauper Lunatic Asylum appropriates so many of-the-moment, crowd-pleasing aural fireworks that it might as well come with an expiration date stamped on it. Granted, Kasabian have never shied away from playing directly to the pub-crawling masses. The band were far more concerned on previous records with fist-pumping bravado than artistic statements. And that, when done right, and when you ignore all the fist pumping, can be perfectly enjoyable. Their self-titled debut, while often resembling a photocopy of a photocopy of a Primal Scream album, was at worst inoffensive and at best mindlessly catchy. Even when it was clear that Kasabian were tailoring their sound to reach as many 18-24-year-old ears as possible, it was hard to deny the instant appeal of all those buzzing basslines and crunchy (but not too crunchy) guitars -- until you actually sat down with a pair of headphones and looked for some depth, of course. But even then, the songs never tried to pass themselves off as the derivative though enjoyable pieces of pop that they were. West Ryder Pauper Lunatic Asylum, on the other hand, finds Kasabian's gaudiest affectations in full blossom. The actual songs -- you know, those things that have verses and choruses -- are often obscured by all the glamour. The opening "Underdog" alone is packed with enough stuff to fill out an entire album: a treated rock guitar gives way to airy acoustic balladry, which gives way to swooping strings, which gives way to a muted electronic bridge, which gives way to a multi-tracked (vocals and guitar and, well, pretty much everything) finale. It might sound at least somewhat interesting, and it is -- but only in terms of how hollow the whole thing ends up sounding in practice. The recurring lynchpins meant to keep everything from falling apart -- Sergio Pizzorno's spiky, descending guitar riff and Tom Meighan's flatline but serviceable vocals -- never manage to draw attention away from the rest of pyrotechnics. As a result, the listener gets lost. Which he shouldn't, because strip all the smoke and mirrors away and "Underdog" reveals itself to be a traditional verse-chorus Britpop tune, and a fairly forgettable one at that. Needlessly exhausting instrumental and stylistic shifts pepper the entire album, and if I were to discuss all the unintentionally puzzling miscellany that crops up throughout its 52 minutes, we'd be here for a very long time (though I'll do the honorable thing and warn you about the gospel choir that takes the stage during the finale, "Happiness"). It's especially frustrating when you look at the more unencumbered tunes on the album -- the string-swept "Where Did All the Love Go?" and the head-nodding anthem "Fire" -- and realize that while Kasabian will never be innovators, they're still capable of writing a tight pop song. 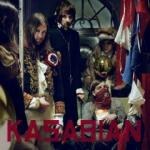 Even Kasabian themselves seem to be gasping for air, and after spending so much time with this album, they still exist as some sort of formless, faceless entity in my mind, an entity glimpsed so faintly -- a solid riff here, a nicely unadorned vocal turn there -- beneath all the smoke and mirrors that, at times, it's far too easy to question whether they're even there at all.